Here is a meal that will change your view of the world. 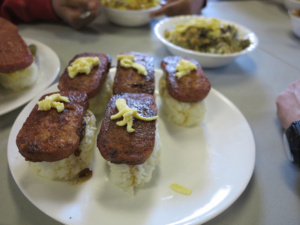 It is SPAM meat meet Japanese most famous dish. This is probably an exclusive dish never tried before today. This dish was prepared for us by our Japanese chef Yusuke. A pinch of vegetables oil. Step 01: Add the rice and the water in a pressure cooker until pressure is built up. Let it boil for 10-15 minutes. Then reserve in the pressure cooker for 10-15 minutes. Step 02: Heat a non adhesive pan with vegetables oil on medium low heat. Step 03: Crack both eggs in a bowl. Mix the white and yellow of the egg until homogeneous. Step 04: Cover the bottom of the pan with a thin layer of eggs. Let it solidify, but it should not burn. The eggs should not change color, for ideal presentation. Reserve on a dish. Step 05: Open both can of SPAM, and cut the rectangular meat into slices of about 1 cm think.. Step 06: Fry both side of the newly made slices in the pan until they start to change color. Step 07: Take a small ball of rice and, by using your hands, shape the rice in a rectangle with a thickness about the same of the width. Make sure the the top and bottom part are as flat as possible. Step 08: Take a small section of the egg omelet (about twice the surface of the rice), fold it in two and place it on top of the rice. Step 09: Pour a small amount of mayonnaise on top of the egg. 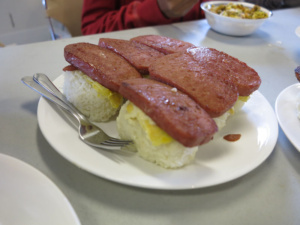 Step 10: Take a slice of cook SPAM meat and place it on top of the mayonnaise cover egg. Step 11: Repeat step 07 to 10 inclusively until you run out of SPAM or rice. To savored this dish you don’t need to need to be a sumo wrestler nor a sushi fan. The only requirement is to want to eat rice and not be afraid to try new things. We had a blast eating this surprising meal. It was astonishingly filling and as delicious as it looked. Hope you will have fun sharing this meal with friends and family. Share this meal and have fun eating it. As always please try this at home.